Saturday was the latest Dreamer's Market - another fantastic day for us. These markets continue to grow in popularity & recognition as the number of returning customers grow & new market attendees express their delight at discovering a market which only has quality handmade products. This was the view from our stall before the customers flocked in. Despite the on & off drizzle, being an indoors market meant the weather wasn't an issue. Continuing roadworks outside the Theatre where the markets are held didn't deter people plus for an added bonus, the Theatre opened the rear doors, attracting passersby. The customers came in a steady stream throughout the day & it wasn't till I got home, I realised I didn't get around to show photos of some of the new stall holders that were there. Dreamers Markets has several returning stall holders, but each time they are held, there is a variety of new stalls to tempt & delight. As regulars, we are also inspired to add new items to our range to offer as well. Here is Sam from Four Red Hens catching up with Deb from Busy Bee Babies & Narelle from Nax Wax before the day got fully under way. Here are just a couple of shots of Sam from Four Red Hens products to show you. 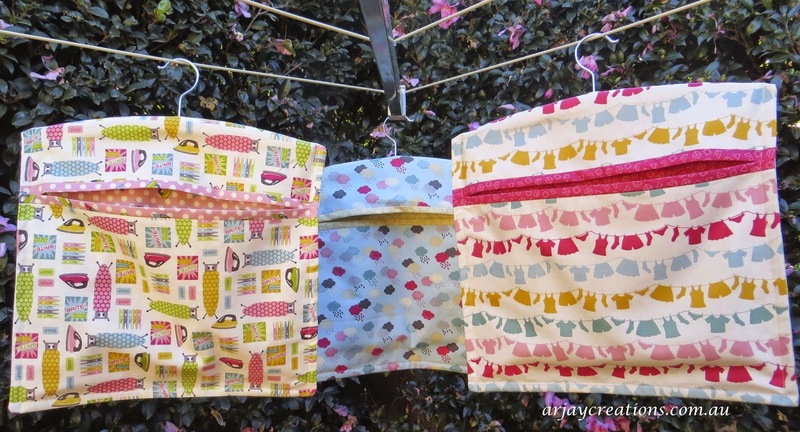 My reversible headbands, peg bags & knitted face cloths are always big hits each market day & my newly released pencil cases proved very popular. I love it when customers also think of creative ways to use products - some of the mini face washers were heading home to become coasters, be appliqued onto a bag front & even stitched to a beret! Another customer is adding ties to her peg bag, removing the hanger & making a peg bag apron - stay tuned for these to be added as a variation at future markets. I was thrilled too to arrive home & find an email ordering 20 of one item - a savvy shopper getting in early for Christmas! If you have never been to Dreamers Markets, they are a not to be missed occasion, only being held a few times a year. Mark your diaries, pop over & like the face book page, the next one will be held Saturday July 18th. Back soon with some exciting news from ARJAY Creations. Your stall set up looks amazing Robyn! Thanks Jane, some days it goes together like the picture in my head and other days it's just..........guess you get what I mean, loving your tips for markets & set up ideas too. Bulky soft items can be hard to display well.